On a sunny day 20 years ago, the Iowa Women’s Archives celebrated its opening with a symposium on Iowa women in political life featuring IWA founders Louise Noun and Mary Louise Smith. En route to the symposium, Smith stopped on the Pentacrest to speak at a rally in support of the Equal Rights Amendment, which was on the ballot in Iowa the following week. The ERA went down to defeat that year, but the Iowa Women’s Archives was off to a great start. Twenty years later, the archives holds rich collections representing diverse Iowa women. 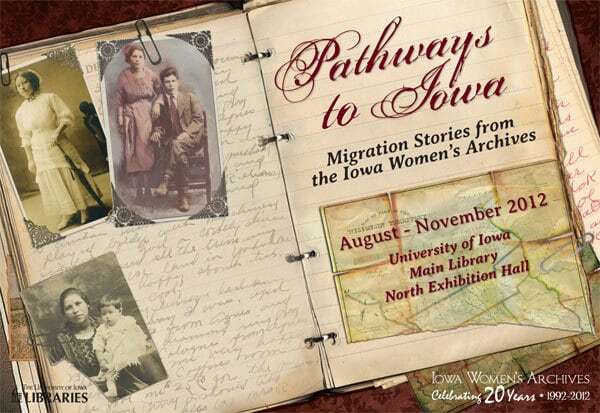 Our current exhibition, Pathways to Iowa: Migration Stories from the Iowa Women’s Archives provides a window into some of the lives represented in the collections, with an emphasis on our Mujeres Latinas collections. 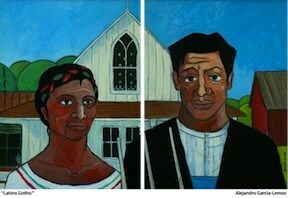 I hope you’ll have a chance to stop in and see the exhibition. Our friend Linda Kerber, May Brodbeck Professor in the Liberal Arts and Sciences, retired in June. A symposium celebrating her career, A World of Citizens: Women, History, and the Vision of Linda K. Kerber, will be held October 5-6, 2012. You can honor Dr. Kerber and support the IWA by contributing to the Linda and Richard Kerber Fund for Research in the Iowa Women’s Archives. A symposium at the University of Iowa, October 11-13, 2012. Following the lecture, there will be a reception in the adjoining North Exhibition Hall of the Main Library, where you’ll have a chance to see the Pathways to Iowa exhibition. Thurs., Oct. 25, 5:30-6:30 p.m.
Judith Houck, “The Medicalization of Menopause Over the Past 100 Years.” Room 401, Hardin Library for the Health Sciences, University of Iowa. Suzanne O’Dea reading from her new book Madame Chairman: Mary Louise Smith and the Republican Revival after Watergate. North Exhibition Hall, UI Main Library. Watch for the date of an exhibit and program exploring the environmental activism of Rachel Carson and her friend Shirley Briggs, an Iowa City native whose papers are in the IWA. Phillips Hall Auditorium & Sciences Library. North Exhibition Hall, Main Library, University of Iowa. 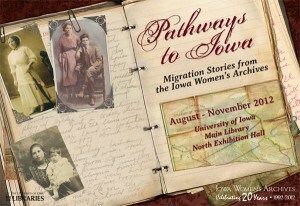 This exhibition explores a theme common to many of the collections in the Iowa Women’s Archives: migration. Documents, photos, and text illuminate the varied ways in which women from Mexico, Germany, Vietnam, and elsewhere experienced migration to Iowa between the mid-19th century and the present. The exhibition also examines the lives and work of Louise Noun and Mary Louise Smith, founders of the Iowa Women’s Archives. Read more about the exhibition . . .